Do you like sushi? Would you like a little eye? 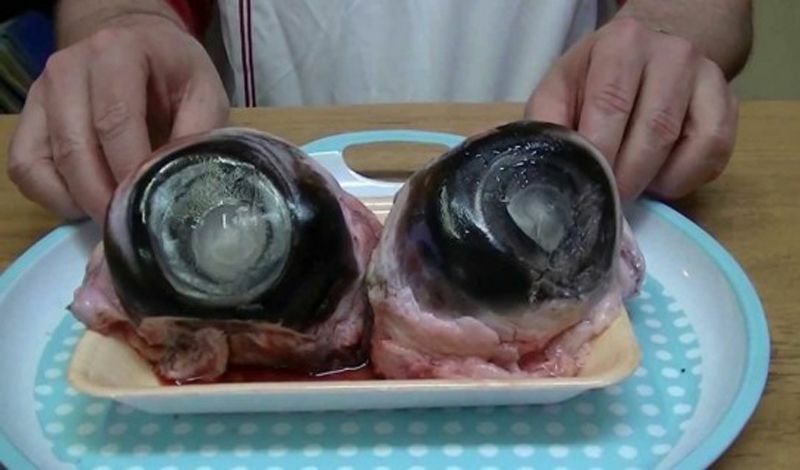 Go into any Japanese supermarket and you will find a large selection of tuna eyeballs looking at you. This delight has a lot of fat and is surrounded by muscles, so it is not a dish for cowards. Both in China and in Japan, the eyes of tuna are considered a real delight. In some places they are eaten raw, although it is more usual to prepare them cooked with miso. Some chefs in Japan have perfected different recipes with tuna eyes balls battered and served with vegetables and some hot sauce. The tuna eye is also served raw, introducing some pieces into a shot glass with serve. Cooked tuna eyes change their color from a transparent appearance to a firmer white, and the muscles and fat surrounding the eyeball are a favorite delicacy for frequent consumers of this dish; the eye itself has a rather intense but not unpleasant taste, which many have described as an "extreme sushi" if it is eaten raw, or similar to mussels when it goes through the cooking process. The nutrition provided by this piece comes from its high content of proteins and Omega 3 fatty acids, which are responsible for a series of cardiovascular benefits, prevent heart irregularities and arrhythmias, and also, improve the percentage of good cholesterol over bad cholesterol in the organism. Would you like to try a tuna eye? If you like this post do not forget to give upvote and share it so that your friends know this rare drink.